Premieres and Streams Wednesday, April 10 at 8 p.m. The egg is perhaps nature’s most perfect life support system. These remarkable structures nurture new life; protecting it from the outside world while still allowing it to breathe. Eggs are strong enough to withstand the full weight of an incubating parent and weak enough for a hatchling to break free. But how is an egg made? Why are they the shape they are? And perhaps most importantly, why lay an egg at all? Step by step as the egg hatches, host David Attenborough reveals the wonder behind these incredible miracles of nature. 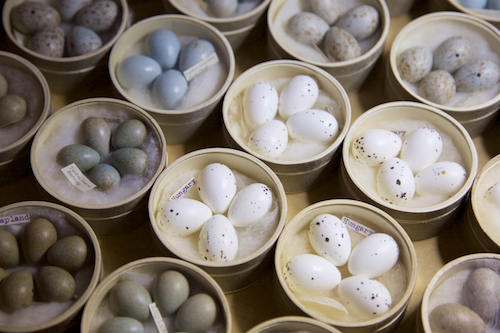 Picture shows: A beautiful selection of clutches of eggs from Tring Natural History museum that has one of the largest collections of bird eggs in the world…mostly from Victorian bird collectors…as egg collecting was banned in the UK some time ago. • There are nearly 10,000 species of birds on Earth and each one lays eggs. From the smallest Bee hummingbird egg to the biggest ostrich egg, birds create eggs in an infinite array of sizes, shapes, colors and patterns. • Birds are hotter than mammals, with an internal temperature of 104 degrees Fahrenheit. No embryo can develop at such high heat, but since they lay eggs, birds can incubate their embryos outside their bodies. Birds also wait to incubate their hatch of eggs until they are all laid, manipulating hatching dates until the ideal time, typically when there is enough food available to feed the babies upon birth. • Bird fertilization is much different than with mammals. After mating, females can store sperm for a few days up to a few months – until the female has collected enough food to enable her ova to amass a yolk big enough to transform into a chick. Only then will the egg be fertilized and begin the 24-hour journey to becoming a full-shelled egg. 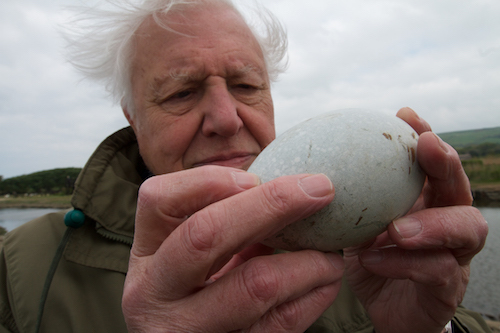 Picture shows: Sir David Attenborough holding a swan egg at Abbotsbury Swan colony in Dorset. 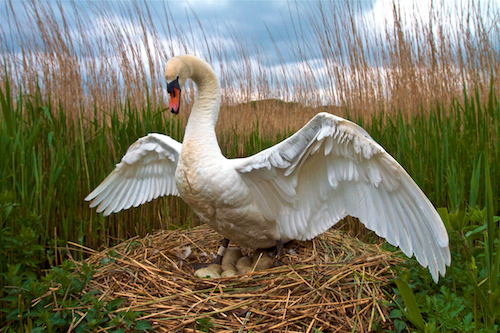 The swan egg is perhaps the largest bird egg in the UK. • The goldcrest is smallest bird in Europe. A female goldcrest’s eggs weigh 18 percent of her body weight, and her tiny body can only cover a few eggs at time while maintaining an incubation temperature of 98.6 degrees. Thermal cameras reveal the secret to her success – the goldcrest has “hot” legs that pump extra blood to radiate heat. No other bird on Earth is known to do this. • The cuckoo never builds a nest or cares for its young. Instead, it tries to trick other species, such as reed warblers, into accepting its egg and raising its baby. Birds see a much more richly colored world than humans so this makes egg mimicry tough to accomplish. Scientists test how closely a cuckoo’s egg must match another bird’s eggs by placing a wrong-colored egg into a reed warbler’s nest. The warbler immediately notices something is amiss and starts to destroy the egg. New research has shown that the cuckoo’s forgery skills are increasingly being put to the test by the warblers, which are producing more elaborate patterns on their own shells – like watermarks on paper money. • Close-up footage of a chick breaking out of its egg shows how the shell has been getting thinner while the chick has been absorbing calcium into its bones, making it stronger and the egg weaker. It also uses the shell‘s calcium to create a jagged tip on the beak to make breaking free even easier. Despite this, it can still take a chick hours or days to hammer its way out of a shell. Picture shows: Male swans often do some of the incubation but not as much as the female as they aren’t as effective because females have a centrally heated brood patch on their bellies. Nature is a production of THIRTEEN PRODUCTIONS LLC for WNET and PBS. For Nature, Fred Kaufman is Executive Producer. Bill Murphy is Series Producer and Janet Hess is Series Editor. The Egg: Life’s Perfect Invention is a Mike Birkhead Associates production for THIRTEEN PRODUCTIONS LLC and BBC Studios in association with WNET. The documentary is directed, produced and written by Beth Jones and Mike Birkhead. Roger Webb is Series Editor for BBC. Presented by David Attenborough. Support for this Nature program was made possible in part by the Arnhold Family in memory of Clarisse Arnhold, Sue and Edgar Wachenheim III, the Kate W. Cassidy Foundation, the Lillian Goldman Charitable Trust, Kathy Chiao and Ken Hao, the Anderson Family Fund, the Filomen M. D’Agostino Foundation, Rosalind P. Walter, the Halmi Family in memory of Robert Halmi, Sr., Sandra Atlas Bass, Doris R. and Robert J. Thomas, the M. & H. Sommer Foundation, Ron Hull, the Hite Foundation, the Bradley L. Goldberg Family Foundation, Charles Rosenblum, the Sun Hill Family Foundation, by the Corporation for Public Broadcasting, and by the nation’s public television stations.